Smt Preeti Sudan, Secretary (HFW) and Dr. Soumya Swaminathan, Secretary, DHR and DG, ICMR, launched the India Hypertension Management Initiative (IHMI) at a function, here today. The IHMI aims to reduce disability and death related to cardiovascular disease (CVD), the leading cause of death in India, by improving the control of high blood pressure (hypertension), reducing salt consumption and eliminating artificial trans-fats, leading risk factors for CVD. Smt. Preeti Sudan, Secretary (HFW), underlined the various aspects of the non-communicable diseases like prevention, detection and management. She stated that creating awareness about NCDs is vital as it is a silent disease. The Health Secretary further said that there is urgent need to raise awareness about NCDs amongst families regarding packaged food and processed foods with excessive salt and trans-fat. She also highlighted the need for incorporating yoga in one’s life for prevention and management of hypertension. Dr. Soumya Swaminathan, Secretary, DHR and DG, ICMR highlighted the importance of initiating and managing treatment for hypertension. She emphasized on the need for public education programme on nutrition and training of frontline healthcare workers regarding management of hypertension. She stated that the risk factors have to be managed at a very young age and we need to look into behavioral issues related to food intake, especially salt. Dr Henk Bekedam, WHO India Representative, highlighted the importance of awareness and detection of hypertension. He congratulated the Health Ministry and ICMR for this initiative and said that this programme will help with the management of hypertension in the country. The India Hypertension Management Initiative (IHMI) is a collaborative project of Indian Council of Medical Research (ICMR), Ministry of Health and Family Welfare (MoHFW), State Governments, World Health Organization (WHO), and Resolve to Save Lives initiative of Vital Strategies. The primary goal of this project is to reduce morbidity and mortality due to CVDs, the leading cause of death in India, by improving the control of high blood pressure, which is a leading risk factor for CVDs among adults in India. The IHMI is focused on five essential components of scalable treatment of hypertension. It will support the adoption of standardized simplified treatment plans for managing high blood pressure, ensure the regular and uninterrupted supply of quality-assured medications, task sharing so health workers who are accessible to patients can distribute medications already prescribed by the medical officer, and patient-centered services that reduce the barriers to treatment adherence. Data on hypertension will be improved through streamlined monitoring systems, and the lessons learned and practice-based evidence will inform further interventions to improve cardiovascular care. 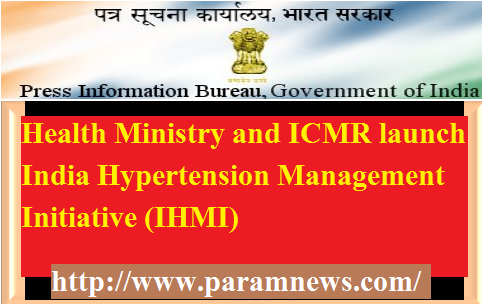 IHMI will be progressively rolled out in 25 districts in the first two years across districts selected by the Health Ministry for expansion of active screening and intensification of treatment activities for hypertension. Around 200 million adults in India have high blood pressure, yet control rates for the condition remain low. Studies suggest that in rural areas in India, only one quarter of people with hypertension are aware of their condition, and only around 10 percent have their blood pressure controlled. In urban areas, around 40 percent of people with hypertension are aware of their condition, and only around 20 percent have their blood pressure controlled. This initiative aims to strengthen the cardiovascular disease component of the Health Ministry’s National Program for Control of Cancer, Diabetes, Cardiovascular Diseases and Stroke (NPCDCS). It will focus on strengthening hypertension management and monitoring at the primary health care level, within the existing healthcare system, and is aligned with WHO’s Global HEARTS Initiative and National Guidelines. Also present at the event were Shri Manoj Jhalani (AS&MD, NHM), Dr BD Athani (Special DGHS) and Shri Pawan Aggarwal, CEO, FSSAI and Dr Alka Aggarwal Singh, Country Director, Vital Strategies along with the other senior officers of the Ministry and representatives of international development organizations. The IHMI aims to reduce disability and death related to cardiovascular disease (CVD), the leading cause of death in India, by improving the control of high blood pressure (hypertension), reducing salt consumption and eliminating artificial trans-fats, leading risk factors for CVD.